Singer Davido, who recently dropped a new song, ‘Gbagbe Oshi’ two days ago following an eleven months music drought, has opened up on his reasons for the hiatus. 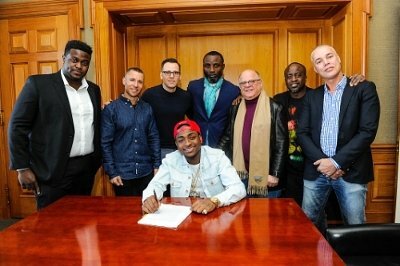 The Sony Music act, in an interview with Thenet.ng, not only spoke about his Sony music deal, he also put to rest rumors about the label behind his delayed comeback. Let’s talk about the Sony deal; Do you think you signed the deal at the right time? I won’t say I signed it at the wrong time, I signed it at the right time actually. So why did it take you 11 months to drop a song? Adele takes 5 years, there are people who take break for 2 years, but here we are used to dropping songs every 3 months, it got to a point I knew I just had to find myself again. So do you blame yourself or Sony for the 11-month drought? Don’t forget during this 1-months period, I did feature on over 24 songs. And it would have been different if I was dropping songs and they didn’t pop. And as at August, they gave me a date and we planned to drop the record with Tinashe but then I was like why don’t you let me do my own African thing and drop the Tinashe record afterwards. Gbagbe oshi was one of the songs that was supposed to be on the album, we recorded it last year. And when they (Sony) heard it, they really liked it. I like it too, I love the drive. After the EP, when is the main album dropping? I can’t say for now, but not this year. It shouldn’t be more than 11 songs on the album. They’ll be about 5 major collaborations on it and for now there’s no working title for the album.